Here are 19 best free bulk image converter software. These let you convert images in bulk into various image formats easily. All these bulk image converter software are completely free and can be downloaded to Windows PC. These free software offer various features, like: lets you convert bulk images into TIF, PCX, BMP, JPG, PNG, YUV, XPM, XBM, WRL, WBMP, TST, TGA, SCT, RLA, RGB, RAW, QRT, PSD, PS, PRC formats, insert watermark into the pictures, convert file name, rotation, size, picture quality, color depth and image format, customize image properties, aspect ratio, file quality and size of the file, accepts the input in more than 160 formats, edit tags, flip images, adjust colors, apply watermark, crop and resize images also. So, go through this list of free bulk image converter software and see which ones you like the most. You can also check out best free Image converter software which help in converting one image format into another or you can check out best free image viewer software. CoffeeCup PixConverter is a free bulk image converter software. With the help of this freeware you can convert file name, rotation, size, picture quality, color depth and image format etc. It lets you convert bulk images into TIF, PCX, BMP, JPG, PNG. CoffeeCup PixConverter can also insert watermark into the pictures. The various options provided by it are 16.7 million colors (24 bit), 2 colors, 256 colors and 16 colors. XnView Shell Extension is a free bulk image converter software. To use this freeware you need to right click on the desired image and select the desired format for conversion. It will then batch convert images to desired format and save these images in the same directory. This freeware can convert images into YUV, XPM, XBM, WRL, WBMP, TST, TGA, SCT, RLA, RGB, RAWRAW, RAW, QRT, PSD, PS, PRC, PPM, PNM, PIC, PIX, PGM, PDF, PDB, PBM, PAT, MTV, MIF, MBM, KRO, JXR, JIF, IMG, IFF, ICO, DPX, DIS, DDS, DCX, CIN, TGA, TIF, PNG, PCX, JPG, BMP and GIF. Send-To-Convert is a free bulk image converter software. With the help of this freeware you can bulk convert images by right clicking on the desired image. It lets you select image files in various formats such as GIF, TIFF, JPEG, PNG and BMP. Send-To-Convert will convert these images into GIF, JPEG, PNG and BMP file formats. Send-To-Convert lets you customize image properties, aspect ratio, file quality and size of the file. SageThumbs is a free software to bulk convert images. For bulk conversion it will only provide the output in jpg format. After installation this freeware will add SageThumbs option in the right click context menu of the Windows explorer. It accepts the input in more than 160 formats. It is a lightweight software. ImBatch is a free bulk image conversion software for your computer. It lets you edit and convert many images together. ImBatch supports a wide variety of image formats such as GIF, PCX, ICO, RAW, BMP, PNG, JPG and JPEG. With the help of this freeware you can edit tags, flip images, adjust colors, apply watermark, crop and resize images also. Rentasoft Image Converter is a free batch image conversion software. To use this freeware you need to right click on the desired images and then select the option “convert image to”. After that choose the desired format for converting images. And the final step is to click on the “Convert” button. Rentasoft Image Converter supports a wide variety of image formats such as PDF, PS, TGA, FCX, ICO, PNG, BMP, TIFF, PSD, GIF and JPEG. Rentasoft Image Converter cannot resize the images. Free Image Converter is a freeware for batch conversion of images and lets you save the converted images in GIF, PNG, BMP, JPG formats. It supports a wide variety of image formats such as BMP, TIFF, GIF, DIB, PNG, JPG and JPEG. Free Image Converter is a lightweight software. It gives you the option to add a single image or whole image directory for conversion. Morz Image Converter is a free bulk image converter software. It lets you batch convert images. It supports a wide variety of image formats such as PDF, PS, PSD, PXM, TGA, PCX, ICO, TIFF, BMP, PNG and JPEG. Morz Image Converter integrates into the right click context menu of the windows explorer. TIFF to JPG is a free bulk TIFF to JPG converter software. It lets you convert TIFF into JPG picture format in bulk. TIFF to JPG can convert multipage as well as single page tiff files into JPG image format. It is a lightweight software. TIFF means Tagged Image File Format and it is mainly used by photographers and graphic designers. Jouba Images Converter is a free bulk image converter. It lets you convert images in bulk in all the famous image formats. It supports a wide variety of image formats such as TIFF, PNG, GIF, BMP and JPEG. Jouba Images Converter lets you convert images very fast. It can also do basic image editing such as modification in color, rotation, quality, image size etc. Smith Image Converter is a free bulk image converter. It can convert images in bulk into different formats. It lets you convert images into PNG, BMP and JPEG formats. It lets you customize images for JPEG compression, resampling, rotation, renaming and image resizing. Smith Image Converter is a useful option for converting images into PNG, BMP and JPEG formats. Tinuous is a free bulk image converter software. It is a lightweight software. Tinuous can do a variety of image optimizations such as rotation, resizing, color corrections, and image quality. Tinuous lets you convert images into a wide variety of formats such as GIF, TIFF, JPEG, PNG and BMP. It can also modify hue, saturation, contrast and brightness of the images. Kigo Image Converter is a free bulk image converter software. It lets you convert images into various formats supported by this freeware. It supports a wide variety of image formats such as PNM, PCX, PNG, TGA, TIFF, BMP, J2K and JPG. With the help of this freeware you can also insert watermark into the images. To use this freeware you need to choose the images that you want to convert. After that specify the format of the output. And the final step is to click on the “Convert” button to convert the images into desired format. Coverseen is a free bulk image converter software. It lets you convert images into various formats. Coverseen can also resize the images. It supports all the popular file formats such as SVG, EXR, DPX, GIF, JPEG, TIFF and PNG. Coverseen lets you compress the pictures and modify the resolution of the pictures etc. Photo Magician is a free batch image converter software for your computer. It can convert images into various formats such as PNG, BMP, JPG, JPEG, GIF, PCX, RAW, TARGA and DDS. Photo Magician also has the ability to resize images in bulk. To use this freeware you need to select the format and size of the output image. And the final step is to click on “Convert” button. Image Tools is a free bulk image converter software. It supports all the popular image formats such as PNG, TIFF, JPEG, GIF and BMP. To use this freeware you need to insert all the pictures that you wish to convert, and then click on the “Convert” button to do bulk image conversion. Copy N Size is a free bulk image converter software for your computer. It lets you convert images in bulk into various formats supported by this freeware. It supports all the popular image formats such as METAFILE, Icon, GIF, PNG, JPEG and Bitmap. It is a lightweight software and is easy to use. Pearlmountain Image Resizer is a free bulk image converter software. It lets you convert images in bulk into format specified by you. It lets you convert images into PSD, BMP, TIFF, GIF, PDF, PNG and JPEG formats. To use this freeware you need to add pictures to the main interface of this freeware and then click on “Convert” button to convert the images. 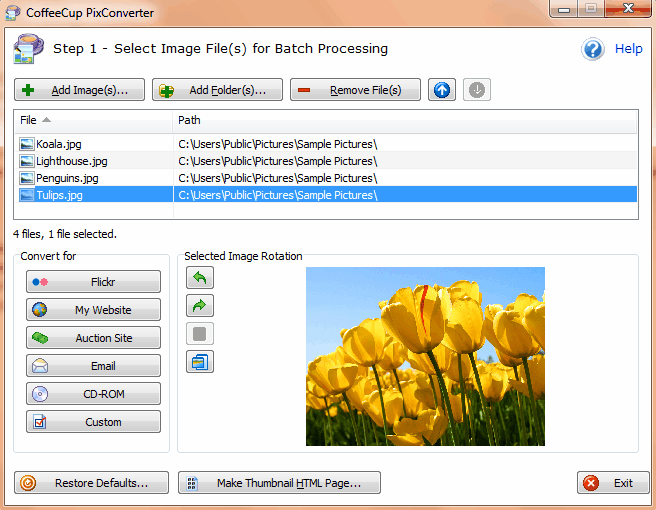 Advanced Batch Image Converter is a free bulk image converter software for your computer. It lets you convert pictures in bulk and also lets you create a level of compression for the format of the output. The compression feature decreases the size of input pictures. Advanced Batch Image Converter supports a wide variety of image formats such as TXT, GIF, MAP, BMP, PSD, EXIF, XMP, PDF, ICM, GRAY, EPSE etc.